Rating is 5 (based on 15 reviews). The SLC examination is a comprehensive test of your sailing knowledge skills. It is a required exam for gaining your SLC Mediterranean sailing license. For the SLC license, there are other requirements as well; see the SLC requirements here. If you are planning on skippering a sailboat on any sailing vacation you should be able to breeze through this test. If you have trouble, it is an indication that you are not properly prepared. The test will take approximately 3 hours of time. There is no time limit and no cost. 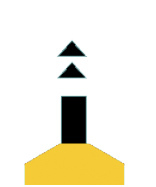 You are sailing east and see this navigation mark ahead. Should you turn to port or starboard?